Mother (Jennifer Lawrence) is a charming but fragile young woman living in a country house with her poet husband Him (Javier Bardem). Though she takes good care of Him, he still struggles with a frustrating lack of creativity until a strange Man (Ed Harris) arrives at the house one evening. Upon learning that he’s an admirer, the poet invites the Man to stay against Mother’s wishes. Soon the Man’s wife (Michelle Pfeiffer) shows up too, oddly full of scorn for Mother. Then their sons arrive as well, followed by others, all welcomed by the poet against Mother’s wishes, and her peaceful world begins to unravel into chaos. 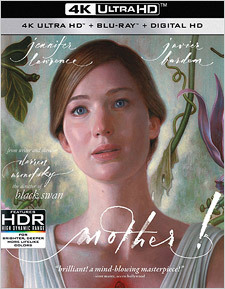 Darren Aronofsky’s Mother! is a very hard film to like. It’s been described as psychological horror, but that’s somewhat misleading. One could just as easily call it a particularly dark and twisted satire. Mother! is the Natural Born Killers of biblical allegory films, a tale of original sin and a damning indictment of humanity and the notion of a venal Old Testament deity, complete with stand-ins for Adam, Eve, Cain, Abel, God, and the Earth, and eventually the entire human race. This is pure art cinema, for better and worse, the kind of film that most audiences hate and that critics can’t help but admire, if for no other reason than that it pushes the medium artistically and dares to break the usual Hollywood formulas and conventions. Lawrence and Bardem each give outstanding (and intentionally frustrating) performances. Mother! is a film you’ll either find intriguing or really hate. And you’ll probably want a drink when you finish with it. Mother! was shot mostly on 16mm photochemical film (using Arriflex cameras, with Red Epic Dragon digital photography used only for a single day of the production), which seems to be Aronofsky’s preferred medium. It was finished as a 2K Digital Intermediate and is presented here in 2.39:1 widescreen, with both Dolby Vision and HDR10 color grades. The resulting image is rather fascinating on 4K, with good detail but also strong grain and a lovely soft texture. There’s a bit of contrast haloing around edges, while the blacks are muddy and crushed. Color has been desaturated slightly for interior scenes yet is pushed in certain situations as well, especially when you see exteriors (through windows and in the film’s few fully exterior shots). The color timing also seems to shift slightly over the course of the film to emphasize certain emotional moments. Aronofsky likens the look of the film to a crust of tiramisu or slightly roasted butter and that’s as good a description as any. The camera is almost entirely handheld and is built around medium and close-up shots of Lawrence, or her perspective, a visual choice that’s often quite jarring. This is a very non-traditional 4K image presentation, but it’s one that represents the filmmaker’s artistic intent perfectly. Audio on the 4K disc is included in English Dolby Atmos. This is a interesting sound mix; not one that some would consider demo-worthy, but keep listening. It doesn’t seem to test the capabilities your surround sound system... at first. Rather, this begins as a highly nuanced and atmospheric sound experience, one of shifting perspectives and very subtle sound cues that seem to come from distant or deep places within the house itself. It’s a mix that creates an air of mystery, but then gradually ratchets up the tension with the buzz of arguments, chants, and eventually a cacophony of chaos. The height channels are used effectively for immersion and to complete the soundfield vertically. As the film progresses, there’s a low rumble that appears in times of anxiousness or anger. Dialogue has wonderful clarity and there’s a real sense of space in the staging. The Atmos track provides a perfect complement to the visuals. Additional audio options include French, Spanish, and Portuguese 5.1 Dolby Digital, along with English Descriptive Audio, with optional subtitles included in English, English SDH, French, Spanish, and Portuguese. These are interesting, but fairly slight, though in fairness it’s hard to imagine that this film requires more. Perhaps an audio commentary might have been interesting. You do at least get a Digital Copy code on a paper insert in the packaging. Darren Aronofsky’s Mother! is an exquisitely artful train wreck, a gleefully spiteful endurance test, and a poetic and feverish cautionary for our times. It’s impressive as hell and every bit as irritating. In a way, it’s oddly reassuring that any major studio would choose to back such a film, especially knowing it’s one that few moviegoers are going to want to see more than once (if at all). Love it, hate it, or possibly both, you have to at least admire the sheer audacity of this work. Darren Aronofsky is one of the most interesting filmmakers working today. Mother! is a fascinating and excruciating cinematic experience. If you choose to have it, 4K Ultra HD is certainly the best way to do so.